This past weekend I traveled to Baltimore with my mom for the Orioles - Royals game. It was a last minute trip so we didn't have much planned. That's why today's recap isn't one about Baltimore. Although, I did love the town and if you have time, go to Miss Shirley's for breakfast and Thames Street Oyster House for dinner. We tried to go to both places but didn't plan ahead so we couldn't make it (read: these places get packed early). We walked around the Inner Harbor, did some shopping and just enjoyed our time together. I've traveled enough that I think I almost have it down to a science. Pack basics, be comfortable and prepare for any weather. Sounds simple enough, right? Let's start with my first outfit. This is one I wore to work, on the train and during my first day in Baltimore. 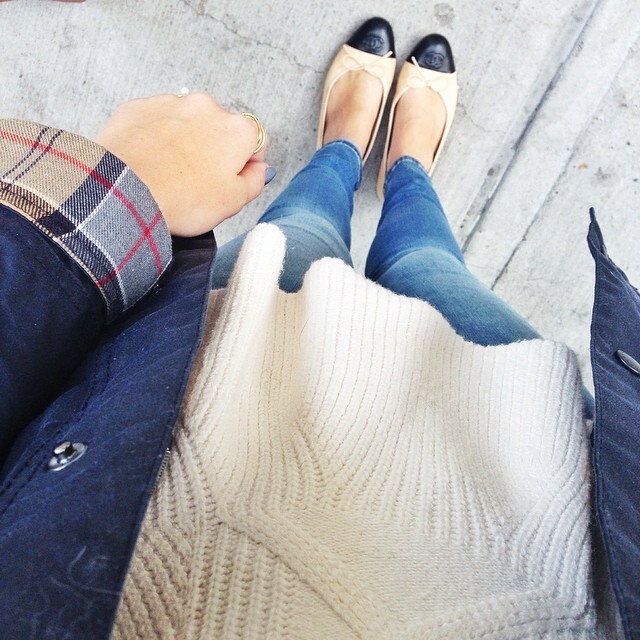 I packed my new pair of Gap jean jeggings, my Barbour, flats and peplum sweater. My barbour jacket is the perfect jacket for any kind of weather. It's water-resistant, it's light enough for a warmer day but still warm enough if it's chilly and it goes with almost everything. My peplum sweater made the trip because it was good enough for work while also being really comfortable on the train ride down. Plus, it's a PEPLUM SWEATER. That's amazing!! The Gap jean jeggings have become an instant favorite in the Robertson household. I'm not a big fan of jeans normally, but these are jeggings and if I wanted to, I could do the splits and still be comfortable. Hello, classy sweatpants. Finally the shoes. I snagged these bad boys off eBay (been wanting them foreverrrr) and I haven't taken them off since. Before New York I was not a fan of flats, but since making the move I officially am. I'm not that upset because I'm comfortable! My second outfit is one I wore walking around Sunday. We had the day to do whatever and it was a pretty decent day when the sun was out. Let's talk about this outfit. This. Wrap. Ohmygosh! My friend at work had one and I 110% needed it so I went out and bought it. Man was it worth it! It's so soft, a VERY good price and it's perfect for those days when it's chilly but not cold out. My simple white elsa top is also a staple in my closet. I mean, you can't go wrong with white! These 'jeans' are just like the ones above but better. They're actually stretchy all over and not really made of denim (although they totally look like it). I currently own three pairs and I've had them since my sophomore year of college. I mean that's how much I love them! My shoes aren't available online, but I did find a similar (and affordable) pair here. Aside from these, my other favorite flats are actually from Target and come in a variety of colors! Obsessing over those Chanel flats & wrap! I definitely thought it was a Burberry wrap when I first saw it. I have to check out those two jeans because I am not a huge denim person at all, but the first pair sound super comfy so I must try it! Love your first outfit - definitely travel comfy! I am in love with both of these looks! I love the peplum sweater and jacket in the first one and that cape looks so cozy in the second travel look. It would be so perfect for those times when you're cold while traveling! My old home! And if I am oriented correctly it looks like my old office is behind you! Love the looks too of course! If it's a good breakfast you want I definitely think you should check out Artifact Coffee in Hampden! Or if you can get a reservation for Woodberry Kitchen they are the bomb! That wrap is so perfect! I love this look for traveling.